The concept of "home" runs all through Scripture. 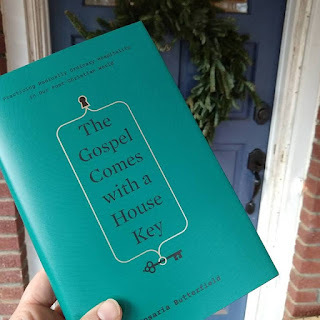 When we first moved into our home, I picked up a copy of Margaret Kim Peterson's Keeping House: The Litany of Everyday Life. And, to borrow from Robert Frost, "that has made all the difference." Peterson addresses the soul-deep and everyday-practical musings that come with making a home (some of which I shared in part two of my "what really matters" series last year). Here, a year later, that book continues to inform my homemaking, as we continue to work to make this house a home that serves our family and others well. Just these past couple of weeks we've been working to swap a couple of spaces so that there's space for children to play closer to the front room when we host Life Group or have others over for dinner. This dovetails nicely with Alan's preference of certain window views for when he's studying and writing. And it works toward an always available guest bed. I seriously love figuring out a solution that better satisfies all the varying personalities and needs our home is called on to accommodate. But the more I roll up my sleeves and dig into the work God's given us here in our community, the more I realize that it's not just about those of us who live here daily. Whether it's ministering to college students, exchange students, children in need of SAFE Families, or the homeless - what we all need is a place to belong and feel at home. A friend of mine recommended following the Daily Grace Co.'s book discussion list for the year. Reading helps my brain sort itself out and helps settle my heart, so I've been working on increasing my reading. Rosaria Butterfield's recent release, The Gospel Comes with a Housekey. Converted as a result of gracious and regular hospitality on the part of pastor and his wife, Rosaria has embraced what she calls "radically ordinary hospitality" as a hallmark of authentic Christianity. This kind of hospitality starts with a firm grasp of Imageo Deo - the reality that every individual (including the unborn child with Down Syndrome and the drag queen volunteering to read at a public library) has been created in the image of God. It starts with an understanding of common grace, of respect (distinguishing between acceptance of a human being and blanket approval of their choices - because these are not the same). It's also firmly rooted in a strong faith that the gospel builds a bridge that invites even the 'unbridgeable' to cross. Acknowledging that "radically ordinary hospitality" will look different for each of us, and different in different seasons, Rosaria makes a case for all of us as true believers to embrace this way of thinking and living. Not all of us will have three tables in our homes. But we can all participate in sharing hospitality in one way or another - whether that be bringing an extra pot of soup or loaf or bread, or helping the host family tidy up afterwards, or perhaps engaging in conversations with neighbors while the coffee brews. This kind of hospitality takes strategic planning and intentional budget stretching, yes. But more, it pushes us to our Bibles and our knees! It invites different perspectives, working through uncomfortable issues, welcoming those who most need a home. In a home with a married couple, it takes working together, balancing energies and strengths. And in a home with children, it takes balancing boundaries and bedtimes. There are a good number of videos available on both Vimeo and Youtube where Rosaria herself addresses the topics in the book. Still I'm personally glad I purchased the hard copy - because not only does it allow me to underline and personalize the content, but strategically placed among my home's decor, it's also a visible reminder to me to check my heart and think through how we're doing at living out the gospel through "radically ordinary hospitality" in our own home. I'm definitely looking forward to the book discussion at the end of March. And I'm thankful for the way God's been working in my heart to help others find a sense of home. More, I am awed at the reality that Jesus left his Home to dwell with us and to find our eternal Home with Him.